Commissioner Bulc promises no more driving and rest time derogations for the bus and coach sector at a meeting with the ETF delegation following a well-attended demonstration against the European Commission plans regarding the Road Initiative. She equally promises no changes to the 45 minutes break. 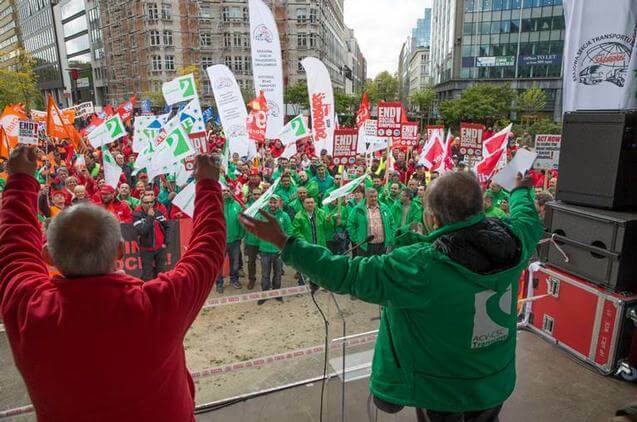 On Wednesday 26 April 500 union activists from road passenger and freight transport gathered together in the European quarter at the Schuman roundabout to hold the European Commission responsible for the future of the driver profession and of the road transport sector. While the Commission launched on the same day the European Pillar of Social Rights, our demonstrators were trying hard to find anything “social” in the European Commission’s intended proposals for the Road initiative. Eight Members of the European Parliament addressed the participants from the tribune reiterating their commitment to fight against driver fatigue and social dumping and to safeguard driver and passenger safety. The Austrian Minister of Transport Jörg Leichtfried joined the union delegations later that morning, talked with union representatives and to the two Romanian drivers who showed him around the truck on display, decorated in a way to give a glimpse over the working and living conditions of drivers working for months far from their home country. Commissioner Bulc unexpectedly descended among our participants and didn’t leave too much room for hope as she asked the activists not to react on rumours in what concerns the content of the future road initiative. However, later on yesterday, when meeting an ETF delegation, Commissioner Bulc could not deny that DG MOVE was working on the temporary exclusion of professional drivers from the scope of the posting of workers directive. Nor could she deny DG MOVE’s intentions to shorten the weekly rest while extending driving time for bus, coach and truck drivers. It required no further explanation why the ETF gathered hundreds of activists in front of the European Commission’s building. The ETF campaign for a social Road Initiative will go on. The good news is that Commissioner Bulc committed to withdraw any further derogations from driving and rest time for the bus and coach sector. This will put an end to the Commission’s intentions to extend the number of consecutive days of driving before taking a 24-hour break. The Commissioner also gave guarantees that the rules on the 45 minute break will not change. This is an important step in the right direction. But bus, coach and truck drivers expect much more. They and the ETF are prepared to bar any attempt to modify the driving and rest time rules and to exclude professional drivers from the application of pay levels and conditions of the Member State hosting driver activity. Commissioner Bulc reassured the ETF that her doors are opened for dialogue at any time. The ETF will be requesting a working meeting with Commissioner Bulc as an opportunity to go through the drivers’ concerns as well as the ETF proposals for the Road Initiative. tThe ETF will go ahead with its plans and organise, between 1 – 5 May an action week on passenger bus and coach transport to raise awareness on driver and passenger safety. And at the ETF 2017 Congress on 24 – 26 May, an appeal will be launched to the European Commission for a Social Road Package.